As a writer, I read a lot. 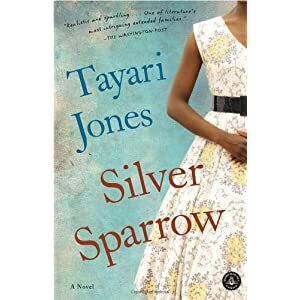 Usually, I always have a book on the go, but this week, I found myself reading like a fiend and SILVER SPARROW was one of the books I devoured. And with an opening line like, “My father, James Witherspoon, is a bigamist,” I didn't have much of a choice but to keep on reading. It’s pretty hard to get a reader invested by the eighth word, but Tayari Jones managed to do it. And she didn't just do it once. Oh no. SILVER SPARROW was positively brimming with killer first lines, and they acted like spurs for my eyes, keeping them open into the wee hours of the morning, demanding that they continue to function so I could know how it all turned out. The book sometimes moves around in time, filling in backstory, but the primary setting is 1980s Atlanta. Not at all where you’d expect, right? That’s why it’s so great! And, really, it’s just another reason why SILVER SPARROW was so engrossing, because almost nothing goes down how you expect it to. James has two daughters: Dana and Chaurisse, and as the back blurb states, one thinks she’s an only child while the other has grown up in the shadows, all-the-while knowing about her half-sister, and having to live her life in a way that protected her father's secret--a heartbreaking situation, to say the least, no matter which side you're on. And when the two become friends when they are teenagers, well, you can see how it’s kind of like two girls trying to navigate themselves through an emotional mine field. With active mines. Like, everywhere. To say any more about the logistics would be spoiler-y, so I’m not going to say anything else in that regard. Overall, I was so engrossed in the tale of these two characters that I was sad when it ended. Ms. Jones has a way with prose that is so relaxed, it’s almost like you’re not reading at all, but instead, listening. I know that sounds utterly bizarre, but that’s the best description I can give of SILVER SPARROW’s flow. It was really like Ms. Jones chose only the most perfect words to tell this tale of seriously complicated family dynamics. It’s not a tear-jerker, so you’ll be able to read it in public, and I’d definitely give it an enthusiastic two thumbs up. And you don’t just have to take my word for it as SILVER SPARROW was one of O Magazine’s Best Books of 2011. You know who owns O Magazine? You really just need to read it.